Digital Vita version reviewed. 'Skullgirls 2nd Encore' is cross buy for the PS4 and Vita. The popular fighting IP 'Skullgirls' is the passion project of Lab Zero Games, formerly known as Reverge Labs. The '2nd Encore' release is a remastered remaster of the original game, which has survived several changes in publisher and legal status (not to mention crowdfunded DLC and developer shuffle). It is Vita and PS4 crossbuy, the PS4 version having been available since July of last year. 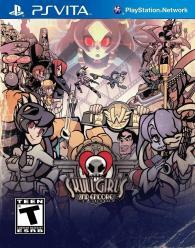 'Skullgirls' has seen many changes since its first release back in 2012, but it remains a fast-tempo, frenetic brawler at heart. As with most fighting games, each match has two combatants (or teams of combatants) staring each other down on a 2D plane, followed by lots of jumping, kicking, and sometimes jump-kicking. 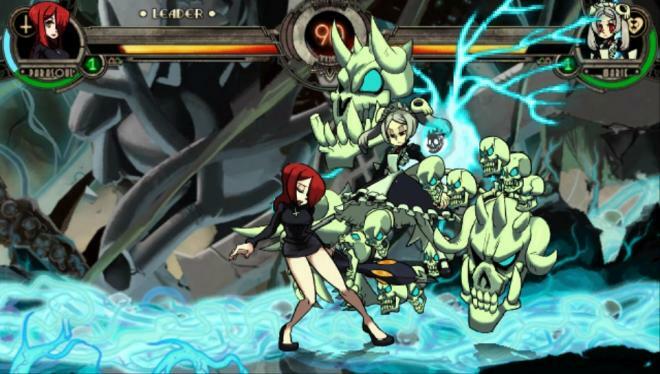 Serious brawler fans will be happy to know that 'Skullgirls' has a deep combo system. Elaborate strings of button presses can be mixed together for amazing damage and dramatic effects. That’s all quite difficult for me, a decidedly amateur brawler, but furious button mashing is a time-honored tradition that is somewhat effective in 'Skullgirls'. The vaunted 'Marvel vs. Capcom' series was a source of inspiration, and several of its mechanics are on display here. Most notable is the tag team configuration. Teams of up to three fighters can be fielded at once, with varying power levels depending on how many are included. During the fight, certain button presses will call in an AI buddy for a quick attack, distracting the enemy and dealing damage. They can also be swapped in and out whole hog for as long as the player wishes, and outtakes are also possible (offensively forcing a character out for someone else on their roster). Team fights offer a more dynamic and over-the-top experience, as the right combo will bombard the screen with explosions, cartoonish weapons, and multiple characters. 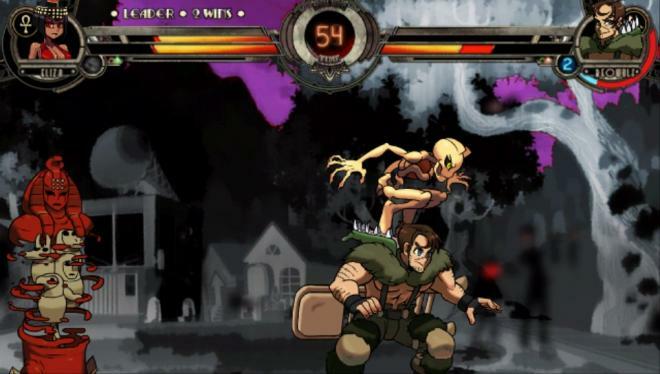 Several of the characters make use of living weapons or full-body parasites, allowing for weird out-of-body attacks. Dramatic tension, a resource built up throughout the fight, can be used for turbo attacks called Blockbusters and other powerful moves. 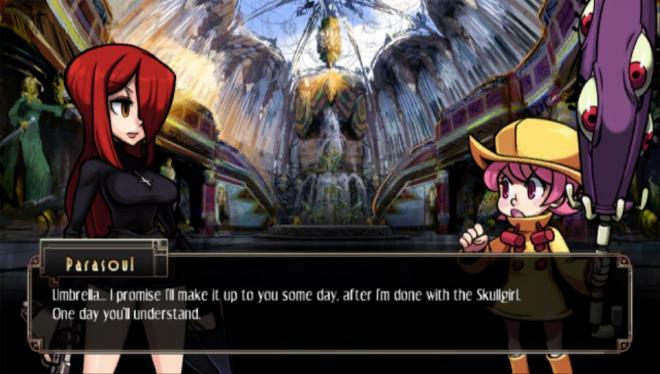 The campaign of 'Skullgirls', which changes depending on the character selected, is not unlike the conversation-based exchanges seen in many games of the Japanese persuasion (not surprising, considering its heavy anime roots). Character portraits adorn the borders and the heroes hurl insults and one-liners at each other. The story is about the Skull Heart or some such artifact that can grant a woman any wish, or turn her into a diabolical, twisted creature, which is what usually happens. Most of the characters are women, and are after the relic for their own purposes - some nefarious, some well-intentioned. The DLC added a few men, who also seek the Heart, but only for its destruction. The campy storylines fit in perfectly with the game’s overall subversive theme, but the cutscenes have a tendency to drag on with unrelated banter, when all I wanted to do was beat people up. Most of the characters have distinct, interesting fighting styles - very important for a brawler with such a small roster. There are no palette swap ninjas here (with the possible exception of Robo-Fortune, although she does have her own skillset), and few stinkers amongst them. My favorites include DLC characters Big Band and Eliza. Big Band is a former cop turned bulky trenchcoated orchestra, with pneumatic instruments galore. Eliza is an Egyptian vampire/lounge singer with an accompanying parasite capable of unpredictable mid- to long-range attacks and debilitating throws. The boss characters are unique too, and very challenging. The original 'Skullgirls' and especially the PS4 version look beautiful. It has an eccentric art design - a mishmash of art deco, anime, 'Felix the Cat', and unabashed upskirts. Much of that has been admirably translated here, but there is a noticeable drop in visual quality. The character models have lost their glossy comic appearance and look rougher, while the backgrounds seem muted and somewhat dull. Lighting on the whole is wanting. The good news is that performance is rarely an issue. All of the campaign is now fully voiced, but it varies in quality - some of the actors sound much more experienced than others. The dark jazz soundtrack that comes with the art deco theme is lovely. As with many fighting games, the constant barks from the heroes can become repetitive over time, but the sound effects are generally quite good. Getting through all 14 campaigns will take awhile, and the movesets are different enough that the experience can change significantly from one character to the next. There is also an arcade mode where randomly generated challenges are dished out, survival mode, quickplay matches against the AI, and the gobs of trials and challenges found in the Training section. There is a multiplayer component with decent options and the entire PlayStation family is cross-play, so there are plenty of opponents. If you enjoy 'Skullgirls' in the slightest, there is a lot to keep you busy in '2nd Encore'. Being a double remaster, a few gifts have been added to '2nd Encore' in addition to its DLC characters and other things. One is a burly, 882-item unlockable art gallery, and it has some truly fascinating pieces (and a complete jukebox). The other is a bonus boss, the painfully difficult Marie 300%, who has her own little story but seems more like a troll than an Easter egg.